Yes, I’m talking about Facebook CEO Mark Zuckerberg, who had his Twitter and Pinterest accounts compromised on Sunday. The hacker group from Saudi Arabia, dubbed OurMine, claimed responsibility for the hack and guess how the group did it? Thanks to the LinkedIn data breach! Mr. Zuckerberg has not sent a tweet from the account since 2012. 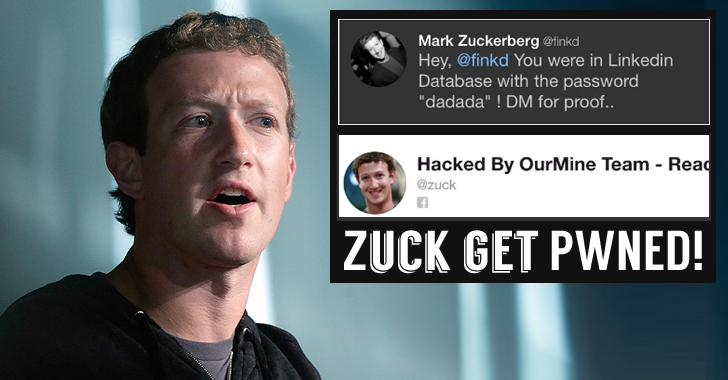 Zuckerberg’s LinkedIn password was "dadada", which he also used for his other online accounts, the group tweeted. So, this might be another alarm for those who haven’t yet changed passwords for their LinkedIn as well as other online accounts that used the same credentials. In tweets now deleted, the group also claimed to have gained accessed to Zuck’s Instagram account, but Facebook confirmed that the group did not access his Instagram account. "No Facebook systems or accounts were accessed," a Facebook spokesperson said. "The affected accounts have been re-secured." More than 167 Million members’ email and password combinations were hacked during a 2012 LinkedIn data breach and had just been posted online. The passwords were encrypted with the SHA1 algorithm with "no salt" that made it easier for hackers to crack them.